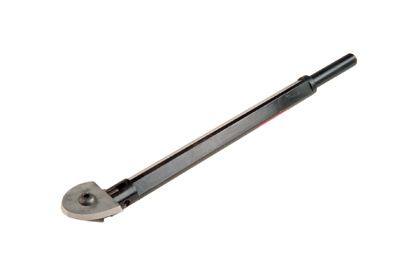 This is a heavy-duty, multi-purpose scraper that is designed to be used in a variety of modes.The shaft is 22mm (7/8in) diameter and the tool length is 350mm (14in). The head swivels, which combined with the adjustable rake angle and a rotating cutter, allows you almost unlimited configurations in use. It is capable of negative-rake scraping, shear scraping and working within hollow forms and deep bowls. The main shaft and head assembly are coated to resist corrosion and the replaceable tip incorporates a top layer of a specially formulated alloy that is designed to hold its edge well. The main shank has two machined flats as well as a round portion along its length. The flats are angled so that the tool can be used between left and right hands for shear scraping in either direction. The round portion of the shank allows you to vary the angle of the tool tip as the work progresses. I used the scraper in two different situations. I firstly used it to achieve a ripple free finish on a wet turned oak (Quercus robur) bowl and the second to take out the tooling marks on the inside of an elm (Ulmus procera) vessel. In use the toolrest needs to be positioned sufficiently far enough back from the workpiece so as to allow the head assembly and socket screws to avoid contact with the toolrest. The tool can be used in either of two modes, that is with the cutter either above or below the shaft; this is achieved by removing the cutter, turning it over, and reinserting the cap head screw. All my work was completed with the cutter in the low mode â€“ under the shaft - as I feel this provides maximum control and stability. I tried sheer scraping to blend the curve and the cutter performed well. The rake angle of the cutter can be adjusted by loosening both the cap screw and the side socket screw.The large screw holds the tip in the assembly whilst the side screw holds the desired angle. On the inside of the elm vessel the cuts were very gentle and only intended to remove remnants of the hollowing tool marks. Most of the work was conducted with the cutter almost flat but rotated slightly downwards; the wood was fairly dry and again, the tool performed well. The cutter was rotated in order to use only a small segment of the curve. A further important adjustment is available as the cutter can be rotated to any position. This will enable any radius to be reflected between the cutter and the work or simply just to expose a fresh section of burr on the cutter. Adjustment is via the cap head screw that holds the cutter to the carrier. When the degrees of rake and cutter angle are considered the scraper is almost infinitely configurable to achieve any angle or cut. My first and last impressions when picking up the tool was its sheer size, weight and mass. I found the tool bulk to be very reassuring. 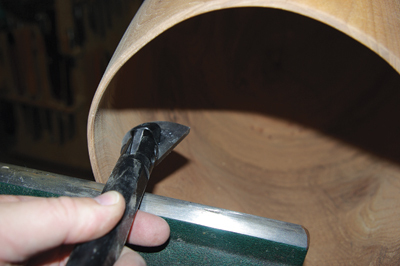 The tool will provide the option to remove both large quantities of wood quickly whilst achieving a fine finishing cut. I like the rigidity and the build quality of this tool. It can be used over a large distance and as Keith says, there is minimal vibration even at the limits of its extreme reach. The cutter takes a very keen edge and can be ground to suit your own preferred angle or shape. The edge seems to last a very long time in use and is capable of aggressive and refining cuts. All in all, a nice tool that does what is says it should.